PEDRO PASSOS COELHO, Prime Minister of Portugal, said that in re-launching growth and employment, the world faced a massive challenge that required an urgent collective answer. To that end, it must correct macroeconomic inequalities, strengthen monetary security and rebalance world trade. Governments, international organizations, the private sector and social partners should cooperate in broad-ranging efforts aimed at restoring the confidence of citizens and firms. He further noted that, during preparations for the Secretary-General’s report on global economic governance, which would be submitted to the Assembly, Portugal had advocated for greater coordination and complementarity between the United Nations, the G-20 and other relevant regional groupings. It was also engaged in the European Union’s preparation for its economic government, which was advancing well. Furthermore, Portugal was moving quickly and resolutely to consolidate its pubic accounts and to implement structural reforms to modernize its economy. Arguing that institutional complementarity between the Assembly and the Security Council was of utmost importance, he said Portugal had pleaded with the Council to work in an open and transparent manner. It supported reforming the Council to make it more efficient and representative, in particular, by giving Brazil and India permanent seats and ensuring that Africa was part of any enlargement. During its presidency in November, Portugal would organize an event on the Council’s working methods, as well as an event dedicated to new challenges for international peace and security. In that context, he stressed that the Organization must invest in a broad concept of security encompassing sustainable development and identifying solutions for global phenomena such as climate change. He also stressed that Portugal’s participation in United Nations peacekeeping missions was one main way it contributed to the effective functioning of multilateralism. As part of the International Security Assistance Force (ISAF), its troops were also working to consolidate Afghanistan’s peace and security to ensure next year’s orderly and successful transition. He underlined his Government’s determination to contribute to the successful transition in Libya as it opened a new era of change and reconstruction. At the same time, Portugal hoped to see “success” characterize the Middle East peace process. After 60 years, there was no time left for advances and retreats, nor for the status quo or unilateral actions that were prejudicial to negotiations. His Government believed Europe had the opportunity to speak with one voice, to build bridges and to facilitate compromises in the context of the Quartet. “It should be clear that, as the creation of a Palestinian State is a promise to be honoured, so too the security of Israel must be firmly guaranteed by the international community,” he said, arguing that Palestine’s admission as a United Nations Member State must be the logical outcome of negotiations. 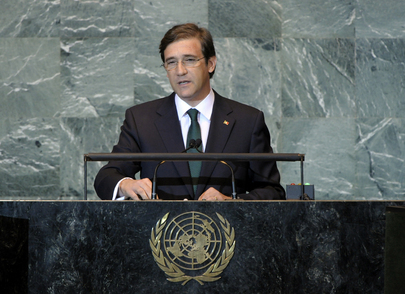 He voiced Portugal’s support for granting Palestine strengthened status within the Organization. He further highlighted Portugal’s ambition for a new economic and commercial relationship, involving a new European “neighbourhood policy” and a renewed Union for the Mediterranean. The Portuguese Government would continue to support the transition process and reform under way in the Middle East and the Maghreb, responding in a coordinated manner to the needs identified by its partners. His Government considered that disintegration of the situation in Syria was unacceptable and unsustainable. Praising the action of the Human Rights Council on that issue, he said the Security Council should also take a position. He stressed that a strong and efficient United Nations must cooperate loosely with other regional and international organizations, including the African Union the Arab League and the Community of Portuguese-Speaking Countries. He said the United Nations Framework Convention on Climate Change (UNFCCC) provided the appropriate structure to fashion a strong agreement and coordinate action between all States. More attention must also be paid to combating desertification and to managing the world’s resource-rich oceans. Finally, he said Portugal was presenting its candidature to the Human Rights Council for the 2015-2017 biennium.